Welcome to our September Stamp of the Month Blog Hop! 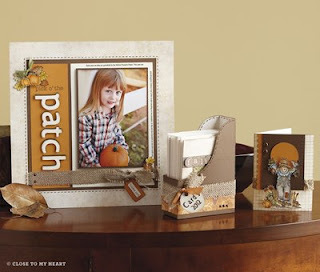 This month Close to My Heart is offering a stamp set called "Fall Favorites". This set can be purchased exclusively through a Close to My Heart Independent Consultant for only $5 with a qualifying purchase of $50. In this hop, you will see projects featuring this fun stamp set from many talented crafty ladies! We hope you enjoy our blog hop today! . If you have just hopped onto my blog, please start at the beginning at Lucy's blog: http://love2createitall.com. If you came from Madeline Morcelo of Inking From The Heart then you are in the right place! I must admit that I had trouble deciding what project to make with this very cute stamp set, until I came upon these pics while cleaning my craft room. The pictures were taken in 2006 when my oldest daughter was just over a year old. I can't believe how big she is now. How time flies! 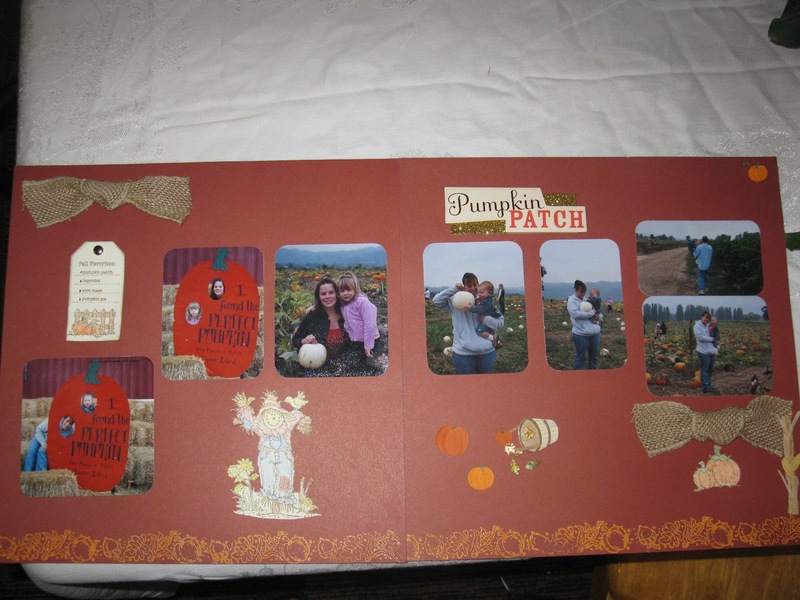 To create this layout, I used the new Make it from your heart book. I love this new how to book! It's small, but packed full of layouts and card ideas! I used Barn Red card stock as my base. I stamped the long stamp along the bottom in versamark, and heat embossed the design in apricot embossing powder. I then stamped the scarecrow on colonial white card stock using chocolate ink and colored him in with our watercolor pencils, dry. I cut the tag on my cricut using my Art Philosophy cricut cartridge, and I stamped the pumpkin with the fence in Chocolate on that and colored it with the color pencils as well. 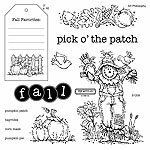 I then stamped the words pumpkin patch, hayride, corn maze and pumpkin pie onto the tag using Red Barn for the letters, and chocolate for the outline. I added bitty sparkles next to the words, and a silver brad from my stash. The bows are our new burlap ribbon (love this!). 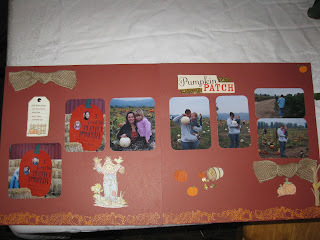 I also stamped and colored the pumpkin on the right page under the burlap bow. The Pumpkin Patch sticker is from Me And My Big Ideas, the smaller pumpkin stickers, and the corn stalk are from Jolees. Your next stop on the Fall Favorites Stamp Set Blog Hop is Laura at Scrappinsweetie's Escape. Darla : Caution: Crafting is Contagious! Thanks for hopping along with us - we hope we were able to inspire you to create your own "Fall Favorites" projects. Glad you decided to do what you did.. Fantastic!!!! Thanks for sharing. Wow, I love your layout using this stamp set! I just love how you used the stamps on the layout. this is one gorgeous happy layout!